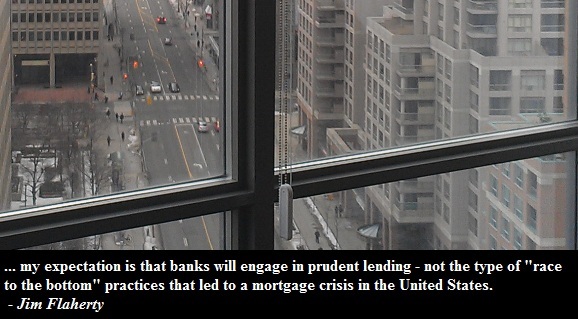 Just as BMO returned its 2.99% fixed mortgage, Flaherty resumed his debt warning campaign. One may wonder whether Jim will tighten the mortgage rules yet again. At the same time another alarm about Canadian housing bubble comes from a global rating agency Fitch. “Actual nominal declines could range from the low single digits (for Alberta), up to more than 15 per cent (for B.C. and Quebec) over the next several years assuming values start falling immediately and taking into account inflation and other market dynamics,” said Fitch. Fitch says that Ontario housing is overvalued by 21%, but most of the declines are not going to be in Windsor or Kitchener. Toronto will take the biggest hit. Downtown condos will be hit even more. Expect the media to focus on the nominal price declines in the future while ignoring the real declines adjusted for inflation. To summarize, so far this year we have IMF predicting 10% to 15% overvaluation, BMO predicting a moderate correction, Carney calling for more housing adjustment, TD expecting a 2.5% drop in Toronto housing prices and now Fitch comes along with the gloomiest forecasts of all, a 20% overvaluation in the Canadian real estate.